From 2001-2008 I served as a LMS Administrator for ISM’s Knowledge Center at the Institute for Supply Management™. The Knowledge Center offered over 120 online education topics and a variety of program types including general business, career development or supply management. The task of populating the Knowledge Center involved created hundreds of educational flash animations and games for over 25 courses that were offered to professionals in the supply management industry. At the Alliance for Construction Excellence (ACE) at ASU I continued creating online courses, but this time they also included video. Some were restored and updated from old recordings, while others were freshly produced and edited. The courses delivered through ACE’s iLinc LMS system were aimed at professionals in the A/E/C industry. Online webinars were also hosted and recorded as well through the iLinc system. Ebooks were produced for ACE members to purchase an read on their tablets as well. At the Lincoln Center for Applied Ethics I was put in charge of recording and editing the Ethics@Noon video series. This seven part series explored controversial issues from the perspective of ethics and promoted civil discourse amongst attendees. Click here to view the full playlist. The Masters Degree program in Educational Technology Leadership (attained in 2005) is an innovative program designed to prepare individuals for leadership roles in improving teaching and learning through the application of educational technologies used in K-12 schools, higher education institutions, corporations, organizations, associations, governments and foundations. The program is founded on three beliefs: (1) that leadership skills and technological competence are fundamental to the appropriate and successful utilization of technologies in educational settings, (2) that access to the requisite knowledge should be universal, despite the barriers of distance, personal physical limitations and lifestyle and (3) that educational technologies focus on improving human performance and learning. Graduates of the Masters Degree are prepared to assume educational technology leadership positions in K-12 schools, higher education institutions, corporations, organizations, associations, government agencies and foundations. Many students apply their knowledge to existing positions they occupy that have responsibilities for education or training and can benefit from the utilization of instructional technologies. The mission of the ETL program is to serve current and future leaders in the U.S. and in the international community by offering superior learning opportunities in educational technologies and leadership; and engaging in scholarly activities to advance knowledge and practice in the utilization of educational technologies. A degree from George Washington University is highly regarded both nationally and internationally. 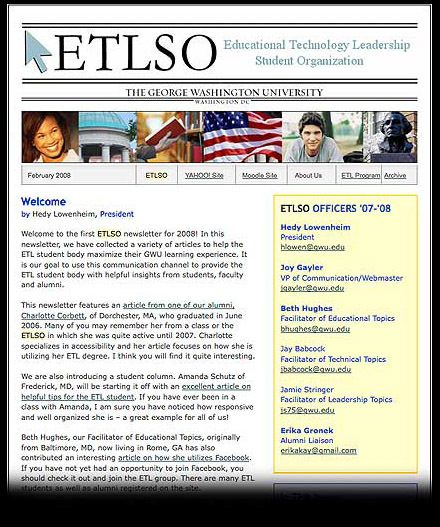 Was the founder and president of ETLSO: The Educational Technology Leadership Student Organization (ETLSO) that connects students of the GWU ETL program with each other and the GWU campus. Most ETL students study from a distance. They are located throughout the United States and other parts of the world. They are separated by geography but joined by technology. This organization is a forum for social and educational events. It is a place to network, demonstrate leadership, practice technology skills, and prepare for the work place. After graduating and passing the project on to successors, ETLSO has lasted for another 10 years and is still going. Gronek, E. (2005). Virtual student organizations: building community in online degree programs. Distance Learning…A Magazine for Leaders, 2(4), November 2005.